Yesterday it was revealed that Disney has agreed to purchase Lucasfilm and all of its assets for just over $4 billion. This includes Industrial Light & Magic, LucasArts and, most crucially, the intellectual property rights to Star Wars. Given how much money the company has earned for Lucasfilm creator (and, until yesterday, its sole owner) George Lucas, many wondered how this might affect the Star Wars franchise going forth, so in an attempt at transparency Lucas filmed a short YouTube video explaining why he opted to sell the company and what happens now. “I felt that I really wanted to put the company somewhere, in a larger entity, which would protect it. Disney is a huge corporation. They have all kinds of capabilities and facilities. There’s a lot of strength that is gained by this,” Lucas says. Chiming in, Lucasfilm CEO Kathleen Kennedy cites the success Disney has had with both Pixar and Marvel, two companies it purchased relatively recently that, while successful by themselves, have flourished under Disney’s guidance. “We couldn’t be at a better home,” Kennedy adds. Throughout the interview (which you can find in its entirety below), Lucas repeatedly claims that Disney is the obvious home for Star Wars. According to Lucas, when he originally set out to make the first Star Wars trilogy in the 1970s, he was repeatedly told that this is the kind of film that Disney should be making. “In many ways it’s the best company possible to take Star Wars into the future,” Kennedy states. Though yesterday’s announcement included news that Star Wars: Episode VII — a film that Lucas himself has been hyping since at least the 1980s — would enter production with a 2015 release date in mind, it offered little word on how this business agreement might affect the franchise. Fortunately Lucas and Kennedy see this development as a positive and believe it will only strengthen Lucasfilm’s ability to produce Star Wars films that live up to Lucas’ quality standards. According to Lucas, he passed along script treatments for Episodes VII, VIII and IX when he stepped down as head of Lucasfilm earlier this year. In turn, Kennedy claims that Lucasfilm has hired writers to turn those aforementioned treatments into full scripts. Those of you hoping that this deal might permanently remove Lucas’ polarizing influence from the franchise however, may be disappointed to hear Kennedy describe Lucas alternately as a “guardian angel” and “my Yoda.” While Lucas is largely removed from the day to day operations of Lucasfilm, according to the interview it seems that he still has a strong advisory role on anything that falls under the Star Wars brand name. “The main thing is to protect these characters. To make sure that they still continue to live in the way that [Lucas] created them,” Kennedy claims. 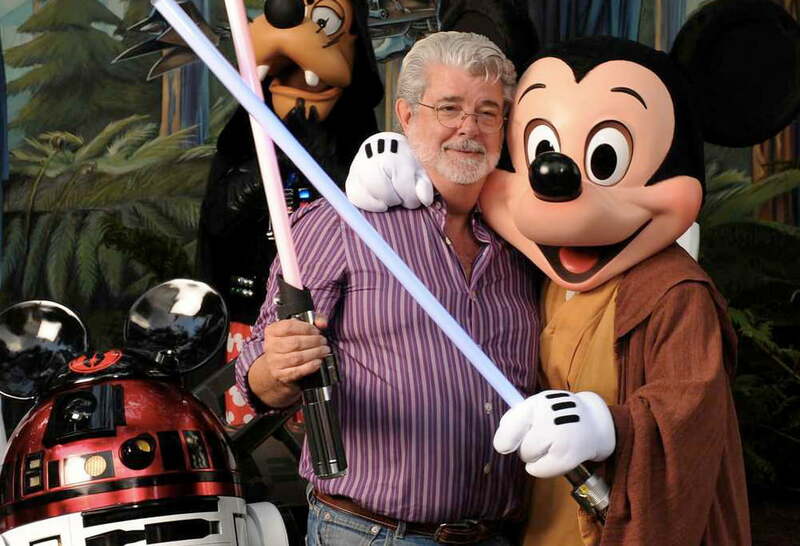 Update: Curious how Lucas plans to spend the $4.05 billion Disney paid him for Lucasfilm? According to The Hollywood Reporter, “Lucas plans to quickly put the bulk of the money into a foundation which will primarily focus on educational issues.” If no other positives emerge from this deal, at least a huge wad of cash is going directly to worthwhile charities.